OP-ED Amazon’s acquisition of Whole Foods has the potential to have a ripple effect across the grocery industry, affecting our food chain from farm to landfill. And one big area this new partnership could shape is combating wasted food. Food waste in the United States has tripled in the last 50 years. We now waste 40 percent of the food we produce. And this adds up: according to ReFED, US$218 billion worth of edible food every year is thrown away. And that’s not just a problem for the one in seven Americans going hungry. It means that we’re wasting 40 percent of all the water, land, animals, and other resources that go into making our food. That’s a cartful of greenhouse gas emissions, which should be a concern for people who care about the planet and for companies looking to shrink their carbon footprint. Globally, wasted food produces 3 billion tons of greenhouse gas emissions. Since 2016, Whole Foods has made stronger efforts to tackle food waste. Its strength lies in donating excess food and selling imperfect produce at discounted rates. Even before these efforts, the stores have been using perfectly good but not-quite-perfect produce in prepared meals and juices. But this agreement could be a raw deal for that progress. Amazon’s record of wastefulness and lack of transparent reporting should sound the alarm for all of us, given this enormous boost to its monopoly over the marketplace. Amazon’s carbon footprint lags behind other giants like Google and Apple, particularly when it comes to adopting renewable energy sources for their data centers, and the company has a history of not being open about its energy sources. Also, Amazon’s wasteful packaging for shipping is worsened by Amazon Fresh, its current grocery service, which over-packages food items. Despite strong rhetoric and a food donation program, Whole Foods has also come under fire for not fully disclosing its efforts to reduce food waste company-wide. And although Amazon recently committed to add solar panels to its massive distribution warehouses, the online retail giant has been criticized for failing to disclose its emissions data. Whole Foods needs to assess and report on its food waste to help us better understand and address the problem. The company should strategically tackle food waste before it is wasted at the supply chain level with smarter purchasing policies. Whole Foods has been headed in the right direction. If Amazon is going to use this to shake up the grocery store model, it would help its bottom line, its reputation, and the planet to implement sound food waste policies all across its supply chain. Meanwhile other grocery retailers—and even food delivery services—are strategizing how to stay competitive. Now they have an opportunity to distinguish themselves by focusing on local economies and truly sustainable and green policies. They can get ahead of Amazon and Whole Foods by committing to zero-waste policies, eliminating buy-one-get-one-free promotions that encourage over-purchasing, helping customers with smart shopping tools, purchasing entire crops from growers rather than rejecting “ugly” produce, and tracking and reporting their waste data. 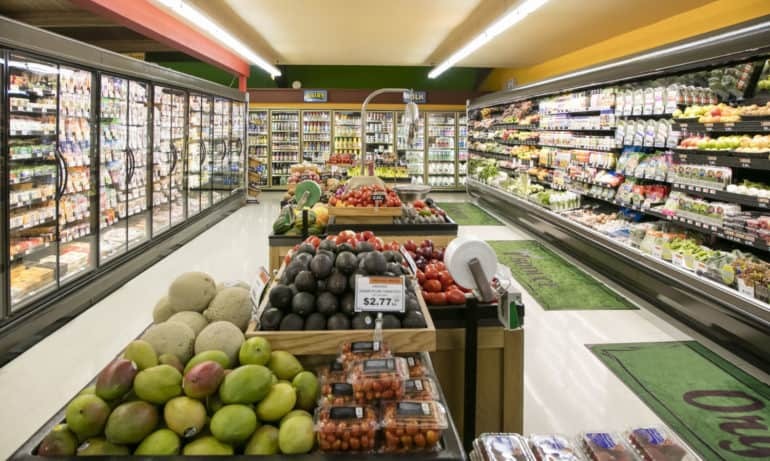 In the United Kingdom, the grocery chain Tesco has adopted these measures and more; the moves have helped it become a more successful company in a competitive market and differentiate itself as a true leader in food waste reduction. Shoppers want to buy food that is sustainable and shop at stores that are supporting rather than destroying the planet. Amazon’s Whole Foods may introduce new ways of selling food—but if it clings to a wasteful past, it won’t be long until it’s bypassed for stores that are selling what we need, show they value communities, and lead in Earth-friendly policies. Voting with our wallets has always been our greatest power as shoppers. We can help put pressure on Amazon to be transparent, modern and green, or we can choose to shop elsewhere. We won’t waste our time on grocers who won’t fight food waste.